Well, it is official. 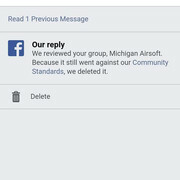 After a more than 12 year run on Facebook, the Michigan Airsoft Facebook group has been deleted. Facebook has determined that what ever was reported (we still do not know) was in violation of their terms of service. This is not the death of Michigan Airsoft by any means, it is only the removal of a linked Facebook group. We will post further updates as they occur.